This makes me smile. 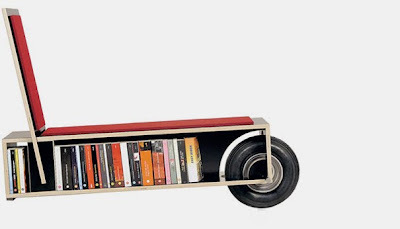 Sure, it probably isn't very comfortable, but I'm a sucker for any piece of furniture that serves as book storage. With a double wink and a nudge, Moormann has swapped out the “i” for an “ea,” leaving us with the punny “Easy Reader“—the perfect moniker for a furnishing that promises an expansive shelf, a luxuriant if slim-profiled chaise, and a front wheel. And since the motorcycle reference remains a bit vague, Moormann has featured front and center the cover page from Lee Hill’s biographical account of the making of the Nicholson-Fonda-Hopper film. If the locomotor potentiality of the piece still has you a might thrown, perhaps the minimalist verbage on Moormann’s website will help: “Quite simply,” it says, “Load. Sit. Read. Relax.” And if I may, I’d like to suggest a continuation of sorts to these mono-syllabic descriptives: “Remove. Re-arrange. 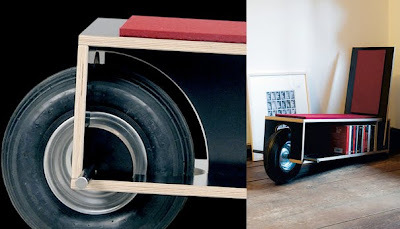 Re-locate.” For this easy portability would seem to be one aim of this ambitious bookcase on wheels, constructed of simple painted birch plywood and what would seem to be the re-purposed front wheel from my childhood tricycle. p.s. 3 Rings is quickly becoming one of my fave daily stops simply because I love their newsletter design. Big and bold and simple with fun content.